When I stepped out of the plane in Phnom Penh, the hot and humid air that got hold of my throat gave me a hint of what a challenge it is to work outdoors (and keep horses!) in a tropical climate. Yoki and Sengly from The Cambodia Pony Welfare Association were waiting for me at arrivals holding a board with my name written on it. As I approached them with a smile, they welcomed me to Cambodia with a big laugh: they were expecting a man! Apparently names ending with” A” are for males here! They quickly got over the surprise and kindly drove me to the Cambodian Country Club, where most of the workshop would be held. In the afternoon I met Rinda Nop, the main vet from the Cambodia Pony Welfare Association, who would also act as my translator and Siraya Chunekamrai, a vet from Thailand and co-founder of the Association, to discuss the program for the next few days. The level of the participants was very varied: most of the younger attendees had studied at an agricultural college here in Phnom Penh, whereas some of the older participants had very little or no formal veterinary education. They are all based in rural communities in different parts of Cambodia and they are the first port of call when a pony is in need. Rinda and the team from the Cambodia Pony Welfare Association visit these communities regularly and whenever they are needed for a more complicated case. During the first workshop held a couple of months ago, they learnt the principles of a clinical examination, nutrition and hydration, body condition scoring and husbandry and they all received a basic kit for performing an examination (Stethoscope, watch, thermometer). I delivered some lectures on wound care, colic, parasites, foot problems and basic dentistry. I was really impressed by the enthusiasm of all the attendees who, despite the language barrier (Rinda did an excellent job translating! ), asked so many questions and participated to the lectures really actively. We had a chance to practice bandaging on the ponies kept at the Cambodian Country Club. By the end of the afternoon, everyone had mastered bandaging of foot, carpus and cannon bone (which appear to be the most commonly injured sites). I had the chance to demonstrate naso-gastric intubation and intravenous catheter placement and fluid administration at another riding stable a few km from Phnom Penh. Some of the participants had a go at the techniques, but these will require longer to master and Rinda will keep tutoring the participants when he visits their communities before they are allowed to perform them on their own. A very interesting of the trip for me was watching Siraya teach about how to achieve a human behaviour change in the rural communities via a participatory exercise.This is extremely important as many health problems affecting the ponies are “human made” (wounds caused by ill-fitting harnesses, insufficient provision of water, food and rest, irregular foot care, inadequate stabling etc.). Using this participatory exercise, community members are not given a lecture on what they should or shouldn’t do to prevent problems identified by the lecturer. They are instead asked to write or draw the problems that they perceive to be most significant to their ponies’ health. After this survey, the most frequent answers are chosen as topics and the community members are split in groups and are asked to identify causes and then possible preventative measures. After this, the vets, now acting as facilitators, are able to give suggestions and impart knowledge based on the framework built by the community members. The participants had a chance to practice this technique during a visit to a community in Koh Ras (about 1 hour from Phnom Penh) and it was a huge success! A lot more pony owners than expected turned up as all the wives joined their husbands and came to the meeting too. The meeting was held in the shade of a beautiful temple and everyone participated with enthusiasm and the “women team” won the competition we set up, having given a lot of good ideas on how to prevent wounds and dehydration. After the meeting, the Cambodia Pony Welfare Organisation offered a packed lunch to the pony owners and all the ponies received a health check (a good chance for the workshop participants to practice!) and a wormer. 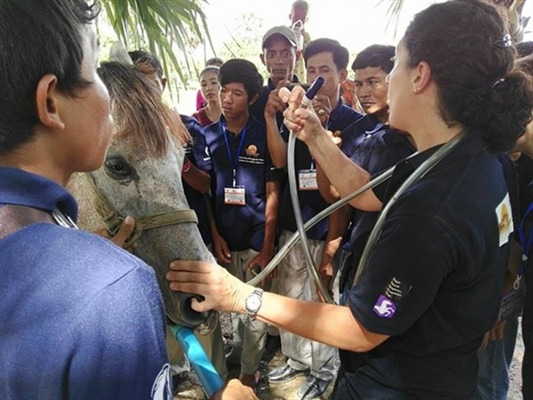 On the last day, we had another practical on foot examination at the Cambodian Country Club stables, where we had the opportunity to treat a pony that had just suffered a cracked sole. I was really impressed with the good level of foot care given to the ponies at the Cambodian County Club by a local farrier trained by the World Horse Welfare during a previous project. As there are no commercial shoes available, he is able to build shoes out of scrap metal, with a very good end result! I had a very positive and enriching experience in Cambodia and I hope that this group of very enthusiastic people will have the opportunity to continue their training in order to improve the welfare of the Cambodian ponies and help local communities.